Lithium ion battery technology offers a large number of benefits in portable power applications but an essential challenge is to ensure safety of operation. Thermal runaway of the device needs to be avoided in both normal and abusive conditions. This article deals with how adiabatic calorimetry can be used not just to test individual components but also complete lithium ion batteries. In case of a thermal runaway, adiabatic calorimetry is probably one of the best solutions available. By using this method, it is possible to determine the temperature at which lithium ion cells or their components exhibit a highly exothermic reaction during use or storage, the quantity of energy released during the reaction, the reaction speed and the pressure level reached due to the formed decomposition gas. The “United States Advanced Battery Consortium” (USABC), in its SAND99-0497 safety testing manual requires that a “worst- case-scenario” test be done with an adiabatic calorimeter (ARC), in which entire, fully charged batteries are to be tested. Adiabatic calorimeters or “Accelerating Rate Calorimeters” like NETZSCH ARC 254 shown in Figure 1 are manufactured to be able to test the possibility of a thermal runaway in batteries or for other applications. The important parameters determined include reaction temperature (onset), adiabatic temperature and pressure increase, as well as the respective rates at which these occur. Using the adiabatic temperature increase, the device can measure the reaction enthalpy and the “time-to-maximum rate” which is the time that elapses until the maximum temperature increase rate is attained. 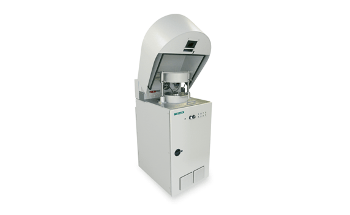 The monitoring and control of the calorimeter is carried out based on the temperature development of the sample. By ensuring the prevention of differences in temperature between the sample and the environment, heat exchange or heat loss cannot occur resulting in investigation of the sample under adiabatic conditions. The “heat-waitsearch” program is a standard measuring technique which involves initial heating of the sample to a temperature just below the expected reaction temperature. If no further self-heating occurs, the temperature is increased step by step until the sample temperature exceeds a certain threshold value within a given period (usually 0.02 K/min). The adiabatic mode of the calorimeter is switched on and the calorimeter is monitored based on the temperature development of the sample. In order to carry out the analysis of lithium ion batteries, there are special sample containers that enable “heat-wait-search” program to be carried out on an entire “18650” cell which is shown in the figure below. The results obtained from the analysis of a customary “18650” cell are presented in Figure 3. The sample temperature, determined at the cylindrical battery surface inside the sample container, is shown as a red line. The rate of self-heating as a blue dashed line. The pressure formed in the sample container as a black dashed line. The initial temperature of 50°C is increased stepwise to 5 K and then the self-heating rate of the sample is determined for 20 minutes. The decomposition of the solid electrolyte interface (SEI) is responsible for this part of the exothermic reaction. The optimum temperature to assess the safety and thermal stability of the cell is 85°C. After a time period of 1600 minutes, the decomposition reaction progresses at a very rapid rate, resulting in an increase in temperature and pressure. The second part of the exothermic reaction is a result of an internal short circuit and occurs due to the decomposition of individual components. An adiabatic temperature difference of 160 K is observed, as well as the pressure in the sample container increases to 64 bar. This pressure increase value is essential for designing the pressure relief valve in the cell. Figure 4 displays comparative results for three “18650” cells or lithium ion cells. The capacity of lithium iron phosphate (LiFePO4) cells, at 1200 mAh and 1100 mAh, is significantly less than the capacity of cells comprising lithium cobalt dioxide (LiCoO2, 2200 mAh). At 80, 92 and 116°C, there is a significant variance in the temperatures at which the self-heating of the decomposition reactions begins. The maximum temperatures attained while using lithium iron phosphate cells is 260 and 297°C, which is significantly lesser than that of the lithium metal cell (473°C). A NETZSCH ARC® 254 Adiabatic Calorimeter is capable of testing entire lithium ion batteries (“18650” cells) in an adiabatic environment and can be also used in a wide range of other applications. The measurement results include an adiabatic temperature increase, temperature increase rate, pressure increase, pressure increase rate, and the temperature at which thermal decomposition begins. These results enable the classification of individual cells relative to their potential risks and hazards, and for the comparison of cells comprising different components. It has been found that lithium iron phosphate cells are much safer than lithium metal cells.